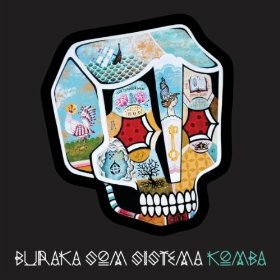 Buraka Som Sistema’s latest effort Komba creates booty-bass music, Angolan style. Hailing from Portugal and Angola, the group combines their native kuduro sound of hip hop, techno, breakbeat and house with their Angolan roots of zouk and semba. This time around they also add dubstep to the mix. Especially on intro track “Eskeleto,” which features grime MC African Boy. Buraka states what Komba means on a prelude to the title track—which is an Angolan religious ceremony held a week after a death to celebrate the life of the deceased. It sounds fitting for a group whose name partially means, “Sound System” in Portuguese. From the up-tempo “(We Stay) Up All Night” to the clubby “Hangover (BaBaBa),” Buraka Som Sistema continues to keep the sounds of progressive kuduro alive.